It's time to share the sketches I did during FurCan Puebla. This was the first one. He's Frost!! When you need a pen and you're a bird, you never have to worry, just use one of your feathers. He's Coldy Grizzpol playing tennis. Another sketch done during FurCan, in Puebla, Mexico. 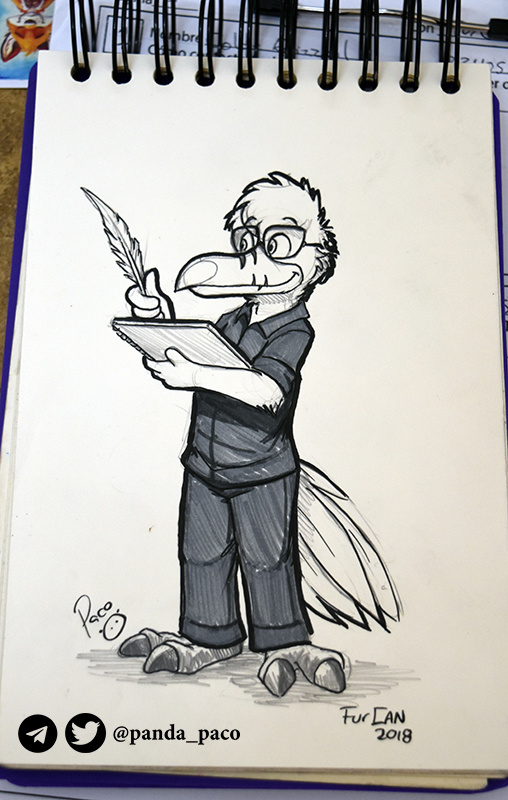 Last pic to share from the sketches I did during FurCan, in Puebla, Mexico. Don't go to Starbucks, go to Kona's coffee hut! A girl skunk for the BrasilFurFest conbook. Oh no! They captured Yoshi Azul . What are they gonna do to him? Those feathers on his head are not just an ornament. Just a "doodle" for Noirex, Azul, Yosh.. , but I have some few colors on my pencil case, let's color it!! -I said. A good memory when Art and Biro visited Florida. It is very hot and humid, but they didn't want to be walking on the floor with their bare legs, so they decided to wear sandals. Request as Patreon reward for Backlash. Not sure why is his belt for, if he's not using pants. New stickers for Selomon the skunk!!! This cute squirrel is Daisy. She is a nature lover who prefers to smell flowers. Let's enter to the Excalibur, said Fuzzy to Kitsy, while they were sightseeing around Las Vegas. In-car drawing! I guess Inkbunny would probably look pretty good on there, if it has a web browser, since it's a portrait display - might use up all your data, though.